In the U.S. there are many laws on the books to protect animals from abuse. But a group of lawyers is trying to take animal rights a huge step further. Led by longtime animal advocate Steven Wise, the Nonhuman Rights Project filed a lawsuit recently on behalf of a chimpanzee named Tommy. Citing evidence of the cognitive sophistication of chimps and other species, the group ultimately seeks personhood status for animals. A number of leading primatologists are among those who support the effort. But there is also enormous opposition – on legal, moral and practical grounds. Diane and her guests discuss the fight for legal rights for animals. Steven Wise Lawyer and president of the Nonhuman Rights Project; author of "Rattling the Cage: Toward Legal Rights for Animals." Charles Siebert Poet, journalist, essayist and contributing writer for The New York Times magazine. Robert Destro Professor of law and director of the Interdisciplinary Program in Law & Religion, Columbus School of Law, at The Catholic University of America. Alan Dittrich President of the Massachusetts Society for Medical Research. MS. DIANE REHMThanks for joining us. I'm Diane Rehm. A growing body of research indicates many animals share more human qualities than previously thought. Self awareness, language, emotions. Now lawyers are using this evidence to fight for personhood status for nonhuman species. Joining me in the studio to talk about the implications of granting legal rights to animals, Robert Destro of the Catholic University of America, joining us from WLRN in Miami, Steven Wise of the Nonhuman Rights Project. MS. DIANE REHMAnd from an NPR studio in New York Charles Siebert, author of yesterday's New York Times magazine cover story on animal rights. I know many of you have strong feelings about these issues. Give us a call, 800-433-8850. Send us your email to drshow@wamu.org. Follow us on Facebook or send us a tweet. Thank you all for joining us. MR. CHARLES SIEBERTThanks for having me. REHMGood to have you all. Steve Wise, let me start with you. What got you started as an animal rights lawyer? WISEWell, it's been now 34 years. I read Peter Singer's book in 1980 and I was a much younger practicing lawyer and I had gone into law because I was interested in social justice issues. And Peter Singer's book opened my eyes to the fact that nonhuman animals were terribly suffering and were being abused and exploited and I thought there was nothing better I could do than to spend my legal career trying to help them. REHMYou're talking about Peter Singer's book, "Animal Liberation," published in 1975. REHMTell us about the lawsuit you and your organization have filed on behalf of the chimp named Tommy. WISEWell, we actually filed three lawsuits on behalf of four chimpanzees in the state of New York as those are all the chimpanzees who we could identify in the state of New York. And Tommy especially was in a small time, Gloversville, New York, and we found him all by himself in a cage and we decided to file a writ of habeas corpus, a common law writ of habeas corpus on behalf of Tommy, on behalf of Kiko, another solo chimpanzee at Niagara Falls and two young chimpanzees who were being held for biomedical research, locomotion research at Stonybrook University. WISEAnd all three of them are common law writs of habeas corpus. We affidavits, about 100 pages of affidavits from the leading working primatologists in the world who attested to the fact that chimpanzees are autonomous, can self determine, an extraordinarily complicated, cognitive lives and we filed those, along with our common law petition for habeas corpus and said that a chimpanzee like Tommy has the cognitive abilities, can self determine, is autonomous, has all of the qualities that a writ habeas corpus is meant to protect. WISEAnd we asked that the court extend the writ of habeas corpus to such autonomous animals as Tommy. REHMAnd what would it have meant if you had succeeded in gaining that writ of habeas corpus for Tommy and the others? WISEWell, we still hope to do it. We lost at the lower court, which we fully expected to do. We're hoping to win in the higher courts in New York and what it would do, it would have a court recognize that Tommy and the other three chimpanzees are legal persons, which means they have the capacity for one or more legal rights and the right that we are asking the courts to recognize is their fundamental right to bodily liberty that is protected by a common law habeas corpus and order them to sanctuaries, which we've already reserved spots for them in sanctuaries where they'll be able to spend the rest of their lives with dozens of other chimpanzees living life as a chimpanzee. REHMSteve, I gather the judge in that first case was sympathetic but he would not recognize the argument. WISEHe was very sympathetic. This was Judge Sise, who is a Supreme Court judge. He, of course, as did another judge in Niagara Falls, had never seen a case like this. Nobody ever has. And they're lower court judges. They're supposed to do what the higher court judges say they're supposed to do and they didn't really have any guidance. So they said that they weren't going to recognize Tommy as a legal person or Kiko as a legal person or Hercules and Leo as legal persons, but now we're taking these up to the appellate courts where we can make our common law arguments to those judges who might have the duty to listen carefully to our arguments and change the law, if they have to do so. WISEThe higher courts can do that. The trial courts really can't. REHMSteven Wise, he's an attorney. He's president of the nonhuman rights project, author of "Rattling The Cage Toward Legal Rights for Animals." Robert Destro, as a professor of law and director of the interdisciplinary program in law and religion at Catholic University, you are, I gather, opposed to giving animals personhood status. Talk about why. DESTROWell, Diane, I think that personhood status is a package. I mean, I think we need to understand that in the law, when we characterize something, when we give it a name, you know, that has certain legal implications to it. And so I'm certainly not opposed to laws that regulate human conduct toward animals. I mean, I don't think anybody is. And in particular, you know, as we learn more and more about the capabilities, the cognitive ability of animals, that's going to affect the moral calculus that we bring to the policy table. DESTROBut the question of do we count animals as legal persons inverts the whole notion of what personhood is in the constitution. DESTROWell, you know, generally speaking, if we go back certainly to the foundational documents, like the Declaration of Independence, you know, and then certainly to the constitution which is built on it, the idea that persons are human beings and when we say a more perfect union for, you know, ourselves and for our posterity, you know, we're talking about human beings who have the capability of being moral agents, of undertaking duties, and as Thomas Jefferson said, man has no right in opposition to his social duty. REHMAt the same time, that same document identified African Americans as only three-fifths human. DESTROActually, that's not exactly right. I mean, that was actually a political maneuver, but it did recognize other persons and so the framers of the constitution took great pains not to put slaves outside the role of persons. And as we have seen, the obligations -- and this is really the part I want to emphasize -- we're really talking about here, even if we take Mr. Wise's suggestions to heart, we're talking about the obligations of people toward animals. DESTROWe're not talking about the obligation of animals toward people. REHMCharles Siebert, you've written about orcas and elephants and other animals. What does the research tell us about the ability of animals to think and feel? SIEBERTWell, it's opened our eyes to, as I say in the piece, not so much their likeness to us, but their compelling sort of parallel complexity that I think definitely deserves a new kind of philosophical regard in accordance with what Steven's efforts are trying to do, perhaps a legal one as well. And I'm not a legal expert in any way. And I got to know Steven and to eventually write this piece through what you're saying my experience writing about these various animals. SIEBERTAnd, you know, on the legal front, I don't even know the ramifications, but I do ask the question in the piece -- and Steven can speak to this better because he's of the mind that a lot of people say, well, current animal protection laws could be expanded or are sufficient as they are to deal with these problems. And Steven has maintained -- and I put that question to him many a time -- and he maintains that they're not and can detail the reason. SIEBERTBut primarily, as I remember him saying, it's that animals are still property and people -- it's very hard to take that property from them. And in the instance of an orca, for example, at Sea World, it's not only legal to have them, but they make tens of millions of dollars a year off of them and, you know, this is an animal that roams oceans, you know, daily, hundreds of miles in complex social groups. SIEBERTElephants, same complex social groups, culture is a word we don't hesitate to use toward these animals. Chimps, the same way. And to be wrenched from their rightful or natural place and put in our world to be ogled at, you know, is legal. And Steven maintains that the only way to change that is not through animal protection laws, but to give them the right to their bodily liberties so they can't be wrested away. SIEBERTAnd the ones who are -- for the ones that are now, it's too late, in captivity, at least they can be repaired to a nicer, kinder version of captivity. REHMCharles Siebert, he's a journalist and author. He's contributing writer for the New York Times magazine. His article, "The Rights of Man and Beast," was the New York Times magazines cover story yesterday. You can find a link to it on our website, drshow.org. When we come back, we'll talk further, take your calls, comments, questions, stay with us. REHMAnd in this hour we're talking about human rights for animals. Just before the break we were talking with Charles Siebert. He's a journalist and author. He wrote a piece for the New York Times magazine yesterday as the cover story, "The Rights of Man and Beast." You can find a link to it on our website drshow.org. Steven Wise, I want to come back to you, as I know you know we have many, many laws to protect animals. They might not be enforced well enough but they do exist. How is what you are seeking different? WISEWell, the problem is is that while there are animal welfare laws, animal welfare statutes, they really don't do a very good job in protecting nonhuman animals. Sometimes I speak to my students and I say, imagine that all of the laws that protect you in every way were repealed. And the only law that existed was one that said, you can't be treated cruelly. And if you are you have to go to the D.A. to bring a criminal action against the person you think treated you cruelly. Would you think that you were being adequately protected? And the answer that everyone gives is, no. WISEYou know, all of human history shows that the only way in which an entity can be protected is if the law recognized them as legal persons, which means they have the capacity for one or more legal rights and then acknowledges that indeed they should have certain sorts of fundamental rights that protect their fundamental interests. By the way, the Nonhuman Rights Project does not invoke either federal or state constitutional law. What we do is we rely upon the common law, which is a law that state courts make. And that is a very different thing than constitutional law. REHMInteresting. Bob Destro, how do you see the differences here? Personhood for animals, how does that differ, for example, from corporations having the right to be considered a person as was decided in the Citizens United case? DESTROWell, there's a big difference. I mean, we, as human beings, form associations. We actually have a First Amendment right to peaceable assembly. And so when we look at groups of people, whether it's a married couple, a church, a corporation, these are organizations of people. So in order to the -- my reaction to a case like Citizens United is to say, well, why do you lose your First Amendment rights when we do -- when we get together as a group? DESTROWhen we're talking about nonhuman rights, it still is a question of, as Mr. Wise just put it, he says the capacity for one or more legal rights, okay. And the -- but the question still -- it begs the question, what duty do I owe? Now the -- as he says, and he's quite right when he says that he's relying on common law and that's very different than constitutional law. The problem is that the common law has always seen animals as being the subject of human rights. So people can own animals. They can possess animals. They can eat animals. DESTROAnd so when you ask the courts to change that rule, you're going to be undoing a whole lot of law. And it's always going to be subject later to legislative revision. REHMBut now in addition to the legal arguments, you really have moral objections to giving legal rights to animals. Why? DESTROWell, I do because the -- it really -- we do come down to the question of duty. And whether we talk about it in terms of morality, in terms of philosophy, in terms of justice, the question is, how do we define the category of persons? And if a person is a -- is more than a human being then we have to have a definition. So our usual understanding is that persons, human beings have natural rights that arise from their nature as is when you start saying, well all right, it doesn't arise from your nature. It arises from your capacity. DESTROOkay. So if your capacity for understanding, for communication, all of those things then, you know, my argument in justice is that we are then going to lower the protection that we have for human beings. Because infants, as Peter Singer himself has written, really don't have as -- they don't have the same kinds of interests. They can't -- they may be able to suffer but they certainly don't have the same cognitive ability as maybe an older chimpanzee does. So the question of how we define who counts as a person becomes very, very important. REHMSteven Wise, what's your response? WISEWell, it's that the professor has it backwards, that by granting legal personhood to such an extraordinarily complex being as Tommy, what that does is it enhances the argument for human beings having legal personhood. If you deny personhood to an entity who is so extraordinary and is autonomous and can self determine and he would otherwise clearly be entitled to personhood except he is a chimpanzee. WISEAt that point you are allowing an arbitrary irrational characteristic to undermine the whole definition of person. And some day that can then return to human beings because if you can arbitrarily deny personhood to Tommy, then you can begin to arbitrarily deny personhood to any of us as well. REHMSteve, tell us a little more about Tommy. Who or how he behaves, what he does, how you perceive him and how you believe he perceives the world. REHM...or demonstrations of how he -- you know he perceives others and knows what they are thinking and how he is thinking? WISEI'll give you an example from there. WISEOh, if -- for example, there's a Swedish researcher named Mathias Oswalt (sp?) who's done a whole series of experiments in which the only way that a chimpanzee could show -- that could pass is that he has to understand that there is a future that he's planning for. And he also talks about a chimpanzee who is in a zoo in Sweden. And what that chimpanzee does -- he obviously doesn't wish to be incarcerated in that zoo and he's angry. WISEWhat he does early in the morning, he gets up, he goes around his enclosure. He picks up stones and then he hides them and he waits for hours later for people to come see him and then he starts throwing stones at them. And he does that often, week after week, month after month. That's just one kind of simple example of -- that clearly shows that chimpanzees understand that there's a future, can anticipate it, can plan for it and then can carry out what they're planning. 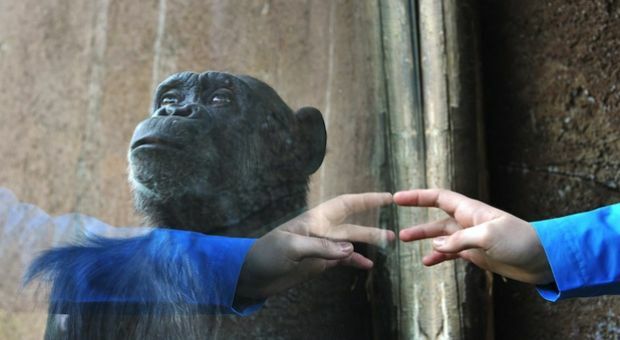 WISEThere have been other experiments where it's clear that a chimpanzee understands, for example, what another chimpanzee is looking at, can engage in not only mental time travel, as Mathias Oswalt shows, but can also put his mind in the mind of another chimpanzee and can see what that chimpanzee's seeing. There are experiments done at Yerkes for example where a submissive chimpanzee will not eat food that a dominant chimpanzee can see. And so when you put up a barrier so that the dominant chimpanzee cannot see the food, the submissive chimpanzee's able to put her mind into the mind of the dominant chimpanzee, see that the dominant chimpanzee cannot see the food and then she can take the food. WISESo we have dozens and dozens and dozens of examples like this. We have one showing that they have language or language-like abilities that they can engage in in simple mathematics. In fact, I think we list almost 60 different complicated cognitive characteristics that chimpanzees show. And we say, look these are extraordinary beings. Why do we think that we should have the right to keep them locked up in a prison in solitary? WISEThey should be entitled to exercise their ability for self determination and autonomy and be able to use -- invoke a writ of habeas corpus so they can go to someplace where they'll be able to live a chimpanzee life with other chimpanzees. REHMWe have a posting on Facebook, a question. "If we say animals have rights, where do we draw the line, cats, dogs, turtles, flies? How about trees? There's evidence that plants think." Facebook message goes on to say, "I'm all for preventing cruelty but does that equal rights? And if so, what rights? Should they be allowed to vote?" Steven Wise. WISEWell, that is the beauty of the common law. The common law is supposed to change and expand as new scientific facts come in, as moral views change, as experience changes. And it's clear that the science has changed and the public morality has changed. So it's now time for nonhuman animals such as Tommy to no longer be seen as legal things the same way my car is seen or the chair I'm sitting on is seen. But have them be seen as legal persons with a capacity for at least the fundamental right to bodily liberty. WISENow where you draw the line, that is a matter of scientific fact. The Nonhuman Rights Project can say that any nonhuman being who is autonomous can self determine, can live their own lives in the way in which they wish. That entity, no matter what her species is and it should be entirely irrelevant, should have legal personhood. And at least the legal capacity for bodily liberty that would allow her to invoke a writ of habeas corpus and be sent to a place where she can fulfill her self determination, where she can live an autonomous life. REHMSteven Wise. He's lawyer and president of the Nonhuman Rights Project and author of "Rattling the Cage Toward Legal Rights for Animals." And you're listening to "The Diane Rehm Show." Charles Siebert, I gather more and more medical search centers are phasing out using chimps. Talk about why. SIEBERTWell, you know, to add on to what Steven was just saying, a bunch of those examples, I thought of another study where a chimp, I think also at Yerkes, was side by side one chimp totally stuffed with food to his heart's content and the other one kept from eating. And there were these big heavy pulleys with handles reaching into each of the chimps' cage. And the hungry chimp needed that full chimp to pull on his side of the pulley to get the food he needed. And the chimp decided as full as he was, to help out his starving buddy. So there's empathy as well. SIEBERTThere's also studies that show that the chimp's brain on the neuronal level is actually stunted by the trauma of confinement. In other words, that they suffer post traumatic stress in the same way humans do. And these are not conjectural studies. These are studies of the actual neurons in the brain in the same homologous portion of their brain, the neocortex as our brain. So right there on a neuronal level we understand there's like the physical evidence of the scarring of captivity on their psyches. SIEBERTAnd parallel studies have been done on elephants the same way. And, you know, these are creatures that develop these brains millions of years before we did, parallel evolution. So I think on balance, knowing all these -- the compendium of these kinds of facts on top of the fact that it's been shown over and over again that very little is to be drawn from biomedical research on chimps, the biggest explosion of chimps in captivity was perpetrated under the -- what proved to be the delusion that they would help in AIDS research. And they proved totally useless. SIEBERTI mean, age -- AIDS made a zoonotic leap from chimps to us. And so chimps can't even get that human AIDS. And so we had this excess of chimps. And all the other types of experiments from pharmaceuticals and cosmetics were just wholly inhumane to begin with. So Bill Clinton's last act, the Chimp Act was to get at least a retirement home called Chimp Haven for a lot of these biomedical chimps. Yeah. REHMAnd now joining us by phone from Wellesley, Mass. is Alan Dittrich. He's president of the Massachusetts Society for Medical Research. Alan, tell us what effect it could have on medical research if animals were given personhood status. MR. ALAN DITTRICHThanks, Diane. Starting with chimps, which is really the subject of focus today, I think Charles is right. There aren't many chimps used in research. They are essential for the projects they're in however. And personhood would have a devastating effect on that research and would have a further devastating effect if it were extended to other species. The main concern, of course, would be that it would breathe uncertainty in the research community. How would personhood actually be interpreted? MR. ALAN DITTRICHWould every chimp in a research facility suddenly be required under a habeas corpus activity to go to a place like Chimp Haven? Or would guardians have to be appointed for the chimps or third party advocates? Would it even be possible to continue to do research at all? And the answer is probably not if personhood, the way that Mr. Wise is defining it occurred. REHMDo you think that there are enough safeguards in medical research now protecting animals? DITTRICHI do. Now, Mr. Wise talks about the common law but of course under federal law we do have the Animal Welfare Act. And chimps and many other animals used in research are covered by these laws that require a detailed study of the proposed protocols before they happen. REHMAll right. And we'll have to take a short break now. I hope you can stay with us. We'll be right back. REHMAnd as we talk about personhood for animals, most especially primates, we were talking just before the break with Alan Dittrich. He's president of the Massachusetts Society for Medical Research. Alan, I do want to ask you, which animals are absolutely necessary for medical research and why? DITTRICHIt's an excellent question, Diane. I don't think I could narrow it to one species or another. Each kind of research depends on the special characteristics of a different species. And so, for example, vaccine research on, let's say, hepatitis C, requires an animal like a chimp. Whereas certain kinds of reproductive research can be done in zebrafish. So it's really dependent on the biomedical concern that the investigator is looking at. DITTRICHAnd as a consequence, a lot of species that you might not expect, in addition to, say, rats and mice and fish, turn out to be good research species. And following today's theme, if personhood were granted to some or all of these species, in effect, research would have to stop on them. REHMSteven Wise, do you want to comment? WISEYes, research should stop on chimpanzees immediately, as I speak. It is grotesque, it is immoral. I think that the doctor may want to think what his grandchildren are going to think of him and what his place in history is. He's on the wrong side of history. He's still advocating as -- and I debated his predecessors 30 years ago. And I hear the same arguments. And he's still advocating enslaving and brutalizing and terribly exploiting beings that are extraordinarily as complicated and cognitively complex and autonomous and self-determined as are chimpanzees. They're placed in solitary confinement. WISEThey're extraordinary social beings. I've been to Africa. I've seen them in the wild. I know what kind of beings they are. I've spoken to the greatest primatologist in the world. Jane Goodall is a member of my board of directors. And to advocate for any reason putting a chimpanzee into the kind of hell that they go through, not only in biomedical research laboratories, but sitting in someone's garage or sitting in a cage in a place where they sell used trailers, like Tommy. Or sitting in a small place at Stony Brook, either by themselves or outside of the group. WISEIt's just, in the year 2014, immoral and it's unjust. And these beings need to be protected by writs of habeas corpus. They need to be legal persons so they have the fundamental right to bodily liberty that protects them, because other than that, they will continue to be naked to our power, the way they always have been. And it has to change. DESTROWell, the biggest problem I have with Mr. Wise's argument, as I said at the very beginning, I accept the proposition that we have moral obligations to animals. And to the extent that there's cruelty, that ought to stop. But at the same time, I have a very fundamental problem with the idea that we, whoever the collective we is -- and we're talking about human beings now -- have the right to decide that somebody is a person or is not a person. And if we take away this notion that person is congruent with the definition of human being, then all bets are off. DESTROAnd this is the point about -- this is all the emphasis on cognitive ability and autonomy. You know, if you go into Peter Singer's work, you will see the argument that a pig has more rights than a newborn baby, or certainly a fetus. And so, you know, the big fight over abortion has always been the legal personhood of the unborn. And so, and all of that, the court said we're completely aware of the development of the unborn human being. It didn't make any difference. The court said we're not going to consider them persons. DESTROThe argument that Mr. Wise is advocating and the arguments that Mr. Singer have advocated basically makes your personhood turn on what you can do. And that's where I have a real problem. WISEYes, well, as the professor I'm sure knows, fetuses of course have rights under the common law and under many state constitutions in every state in the United States. They are only not persons within the meaning of the 14th Amendment to the United States Constitution, which has its own particular meaning. Also autonomy is not what philosophers might call a necessary condition. We're saying it's sufficient. It's simply if somebody has autonomy, that alone should qualify them for rights. And finally, personhood is not now nor has it ever been congruent with human beings. WISEI wrote a whole book about the Somerset case in 1772, where James Somerset used the common law writ of habeas corpus to become a person, because black slaves were not person, either in England or in the United States. What personhood means is that the entity who is a person, it's someone that the court should recognize as being important in some fundamental way. So some examples we give in our brief in other common law countries is in Pakistan, a court has recognized a mosque as a person. In India the holy books of the Sikhs are recognized as persons. WISEAnd in 2012, the crown and the indigenous peoples of New Zealand entered into a treaty in which a river was seen as a person. So persons have never, ever been seen as being congruent with human beings. And so it means simply that they're important, that they ought to count in a courtroom. REHMSteve, you tried to sue on behalf of a dolphin in 1991. What happened in that case? WISEAh, yes. I actually filed two lawsuits on behalf of dolphins when I was -- that was 23 years old, when I was younger and more foolish than I am now. What -- although we did indeed enter into an agreement with the New England Aquarium and the U.S. Navy not to transfer a dolphin named Rainbow to the U.S. Navy from the New England Aquarium. I then filed a second lawsuit on behalf of a dolphin named Kama, which I lost. WISEAnd the reason I lost, actually, has been a -- one of the catalysts for the work I've done in the last 23 years, and I lost on grounds of standing. The dolphin herself was not seen as being a legal person and no humans were seen as being injured. And so they could not sue on her behalf. And that was one of several cases that caused me to believe that functionally it was impossible for human beings to protect the interests of even such extraordinary beings as dolphins and now chimpanzees and others as well, who are legal things, who are seen in law as chairs and automobiles. WISEAnd that the only way they're going to be protected is if they're legal persons. REHMAll right. I'm going to open the phones now. First, we'll go to Orlando, Fla. Hi there, Chris. You're on the air. CHRISHey, Diane. First-time caller, long-time listener. I've got to say, I love your show. CHRISYou're welcome. I have to say one thing. As an African American hearing this topic right now by your talkers, I find it kind of funny because we live in a country right now where, right now, Syria, Ukraine, even in Africa, you have violations on humans on civil right -- on human rights acts. And now we're trying to infuse animals into the mix? He sounds a little, you know, confusion and silly to me just to hear something like that. But that's just me. I'd like to hear your opinion. REHMAll right. Thanks for calling. Steven Wise, how do you make your case? WISEWell, one time the whole idea that African Americans or blacks anywhere in the world would be legal persons and have any kind of rights was seen as silly. It was not silly. It was deadly serious. And the reason that they were not given rights is that they were the victim of invidious discrimination. And they now have their rights, even though they're not treated the way they should be, as the events of the last week have shown, where twice people in public have said terribly racist things. But there are other entities who are deserving of personhood, because they are not like human beings, but they're like themselves. WISEWe're not asking for human rights for chimpanzees. We're asking for chimpanzee rights for chimpanzees. WISEWe're not asking orca rights for orcas but -- I mean, we are asking for orca rights for orcas, not human rights for orcas. REHMAll right. Let's go to Joanne in St. Louis, Mo. You're on the air. JOANNEThank you. Interesting discussion. I want to make a couple of points. Are you there? I'm not hearing you. JOANNEOh, great. Okay. First of all, I'm disturbed by the medical research personnel who has indicated that research would be devastating -- or devastated if we were not to use animals in research. I guess my feeling is, once again, humans are reducing animals to things and property and using them as means to our ends -- noble ends, for sure, but means to our ends. And that does violence to our own souls. That's very disturbing to me. And the second point I want to make is to continue to regard animals as mere things is to -- it lets us off the hook. JOANNEIt allows us to avoid really, really hard questions about our industrial food production system, about sport hunting, about the lab research and about environmental protection regarding wildlife habitat, et cetera, et cetera. I think it's really time we reexamined our attitudes toward animals. And I'd appreciate your comments. Thank you so much. REHMAll right. First to you, Alan Dittrich. Alan, are you there? DITTRICHYes, I'm here, Diane. Can you hear me okay? DITTRICHI'd like to respond to two things. One, to Steven Wise's somewhat colorful and I would say very prejudicial language about biomedical research. As he knows, the world of research has changed in the 30 or 40 years that he's been involved in this project. And even the great Jane Goodall says this, as long as chimpanzees are used in medical research, it's our responsibility to treat them as humanely as possible. And I think that that is really the goal of the researchers right now -- humane treatment. DITTRICHAnd in answer to your most recent caller, of course, I think it's fair to say that, yes, the fundamental primary goal of animal research right now is to help humans. But let's not forget that a lot of that then goes back to veterinary medicine or medicine for animals in the wild and the vast improvements in veterinary care over the last 30 years can in part be attributed to the animal research that we do fundamentally for humans. WISEWell, of course, Jane Goodall, when she said that, was advocating for a second that any chimpanzee should every be used in biomedical research or even be in a cage. She was saying, if they have to be, then you should treat them as humanely as possible. But Jane in no way supports ever putting a chimpanzee in a cage for biomedical research or for any other purpose. REHMAnd you're listening to "The Diane Rehm Show." Many of our listeners want to know what Joanne was getting to at the end of her question. If animals are declared persons, what are the potential ramifications for agri-business, meat-packing plants, or simply the right to eat meat. Robert Destro. DESTROWell, she's put her -- she's certainly put her finger right on the nub of the problem, which is going to raise really hard questions. And indeed it is. And that's why, using the common law, I think it's a very creative way to use the courts. But you're not going to be able to avoid this, because legislatures can turn around and change the common law by statute. DESTROAnd that's why there are plenty of statutes preventing animal cruelty. But you will see, if you look in Poland for example, just recently they outlawed kosher slaughter. You know, and so there's a movement across the board to get us away from using animal protein. And that raises really hard questions. REHMAll right, so what's next in this argument, Steven Wise? Where do you go from here? WISEWell, we are going to be continually filing a whole -- a series of suits. The suits involving the four chimpanzees in New York are simply the first salvos in a long-term strategic litigation campaign. It's taken me 25 years to be able to get to the point where we're able to file our first suits. And now there's going to be a lot more coming down the pike. We may be filing our next suit within the next month in New York. We certainly are preparing other suits to be filed in other states. WISEAnd we're going to begin to challenge courts to do the right thing, to do what is just, to understand that experience has changed, morality has changed, what we know about non-human animals has changed and that there are at least some who are autonomous and can self-determine, who indeed ought to, under any calculus and using the principles that they use now of liberty and equality, should be recognized as legal persons, with the capacity to have at least one right, but perhaps more. WISEAnd then we're going to challenge them as to which rights these non-human animals should have. And that's what judges will have to grapple with and we feel confident that they'll do their duty. REHMDo you believe it's going to go as high as the Supreme Court? WISE...and treaties. But it'll be going to a lot of supreme courts, in New York, where they call it the court of appeals, and in many other states, too, as we continue to bring these sorts of lawsuits. REHMWell, I want to thank you all for a most interesting discussion. Steven Wise, he is president of the Nonhuman Rights Project. Robert Destro, professor of law at Catholic University of America. Charles Siebert, he's a journalist and author. He wrote the cover story for yesterday's New York Times magazine, titled, "The Rights of Man and Beast." You can link to that story through our website, drshow.org. And Alan Dittrich, president of the Massachusetts Society for Medical Research. Thank you all. Thanks for listening. I'm Diane Rehm.